I made these a while back and wanted to share them with you. There are only 4 inside the pack and they come in eps format. I hope you like them. I would love to see how you use them. Jason Munn is originally from Wisconsin but now calls Oakland, California home. His design studio The Small Stakes is mainly into music related art such as CD cover design, poster graphics and Apparel. Jason has worked for some of my favourite bands including Death Cab for Cutie, Modest Mouse, Nada Surf and The Shins. I would describe his style as being retro minimalistic. Great Stuff! Chuck Anderson is a 22 year old self-taught graphic designer working in Illinois. His client base includes Absolut, Bacardi, Nokia, Sony and Urban Outfitters to name only a few. I especially like his lightning effects, but his composition skills rock too. Check his work at nopattern.com, his own design company. You’ll also be able to read up on him in the many articles featured on his site. jp33.com is the award winning website/portfolio of Jeremy Prasatik. I doesn’t reveal a lot about himself, but he shares his beautiful work with us. Personally that’s enough for me. Take your time and browse through the endless pieces he has to offer. 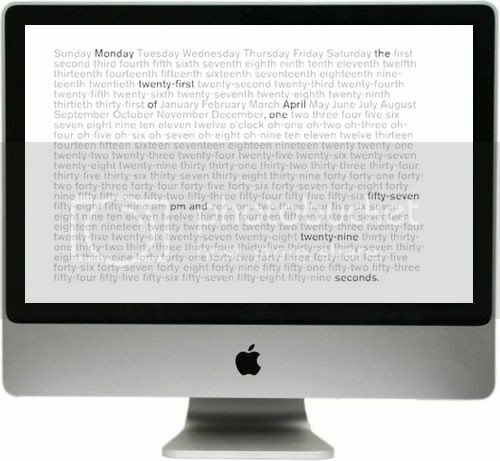 Word Clock is a typographic screensaver for Mac OS X. It displays a fixed list of all numbers and words sufficient to express any possible date and time as a sentence. Word Clock displays time by highlighting appropriate words as each second passes. Supersteady.org is the personal portfolio of Paolo Lim based in South Australia. You won’t find a lot of information about him except that he’s working freelance and comes from Manila. Well, they do say a picture says a thousand words. Karoly Kiralyfalvi aka Drez is a 26 years old freelancer graphic designer, living and working in Budapest, Hungary. His main competences are: vector based graphics and illustrations, typography and lettering. He gets inspired by music, graffiti alongside other art forms and everyday life. Furthermore he’s a member of the Keystone Design Union. His portfolio at www.extraverage.net is enormous and the client list reads like a who is who of today’s biggest companies. It was really tough on me to pick a selection of his work since there are so many good designs. This is only the tip of the iceberg. Now it’s your turn to dive down and discover the rest!